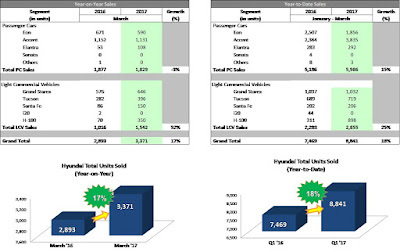 Hyundai Asia Resources, Inc. (HARI), the official distributor of Hyundai vehicles in the Philippines, closed March 2017 with record sales of 3,371 units, the highest monthly output in the company’s 15-year history. This pushed first quarter sales to 8,841, up by 18 percent as compared to the 7,469 units sold in the same period of 2016. 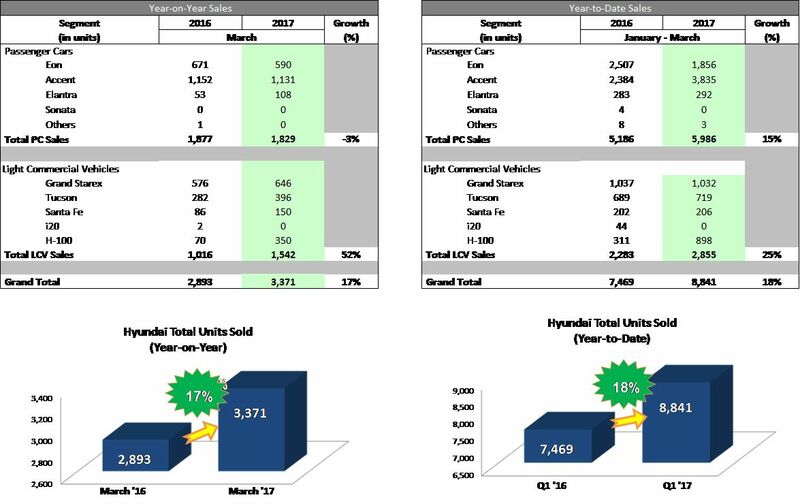 At the forefront of HARI’s auspicious performance is its volume driver, the Passenger Cars (PC) segment which grew by 15 percent from 5,186 units in Q1 2016 to 5,986 units in Q1 2017. Credit goes to the Accent as it remains as the brand’s top-selling nameplate with 3,835 units sold in the first three months of 2017. The Light Commercial Vehicles (LCV) segment was not to be outdone as total Q1 2017 sales reached 2,855 units, a 25 percent increment from the previous year’s 2,283 Q1 sales. The growth in this segment is largely attributed to high pickup for the brand’s utility truck, the H-100. With economic growth expecting to remain strong, HARI is expecting its growth to continue this year. The introduction of models such as the Creta at the Manila International Auto Show (MIAS) will undoubtedly contribute to further sales increase when deliveries start in the next few months. Always Partners with Family and Friends.